Wouldn’t it be nice if your home was large enough to have a separate play area for the kids, an area for you to watch television, and a separate area for everyone to coexist and still be happy? Well, maybe in a dream world, but in the real world, most homes have to be creative when thinking of areas for the kids to play. Quite possibly, the main gathering areas, such as the living room and family room have to accommodate the kids, the older siblings, and the parents. Here are tips for creating multifunctional play areas that the whole family will enjoy. Expand upon what you already have: In many homes, you already have the ‘bones’ for a good playroom. Consider using main walls of your living room or dining room that have plenty of space for kids to be imaginative with. Wide open walls can be used for bulletin boards, lining up easels for art projects, or can be painted with chalkboard paint for the ultimate in non-stop creativity for your kids. If you are handy with do it yourself projects, consider building built-ins for desks for adults and children to utilize while other family members are using the wall chalkboard. Turn unused space into a playroom: If your home has storage space or rooms that are not being used to their full potential, consider transforming them into multifunctional play area and congregating space. Basements, storage rooms, and unused dens or offices are good spots to transform. The advantage of these areas are the ability to take playful, whimsical wall colors, fun furniture, and combine the space with adult sized furniture, and storage, and the space instantly can house all ages of the family. Use one wall for a television and video game area, and the entire family will enjoy using this space at separate times of the day. Combine education and play: For many homes, the ability to have a separate studying quiet area and an activity play area is not realistic. Combine the two functions, and separate at what times of the day you house the separate activities. Desks for kids that have computers and organized space for school work and activities, can later be used for board games and crafting projects. Consider using desks that have plenty of top work surface space and can take advantage of vertical wall space as well. Organization stores have great ideas for hanging baskets, shelves, and colorful bins to keep kids’ belongings close at hand, yet out of parent’s way! Share the space, but still make it fun: If you live in a small home or an apartment, find ways to share the space with your little ones, but still make it fun. Opt for neutral tones and use organizational decor to add color, and creative inspiration. Colorful rugs, accessories, and wall decor can make your child feel like they aren’t giving up being a kid! If your main area has to be used for adult entertaining at a later time, opt for family friendly furniture slipcovers, and transitional color palettes that will make your home still feel sophisticated. A neutral palette of chocolate browns mixed with blues and greens can feel grown up or kid-like, depending on what decorative accents you have in the room. Having a multifunctional playroom in your home can keep the sanity between all family members. Since children don’t play 24 hours a day, it is realistic to house a playroom in the same place where you have common household activities. For open floor plans that have a great room, instead of individualized space, consider housing louder play areas closer to the kitchen area, and quieter play areas closer to the bedrooms. This will help your household maximize the benefit of combining multifunctional playrooms, and make you happier at the end of the day. Play areas can be much more than a swing set and a sandbox. Here are some ideas for making your children's play area interesting and safe. Consult your kids. Children have wild imaginations. Approach their fantasies with a can-do attitude instead of a roll of the eyes. Include elements that kids can adapt to their own purposes using only their imaginations. Kids can transform a stick and an old box into a pirate ship, but they cannot transform a prefab pirate ship into a dodge ball arena. Strive for versatility. Include elements that allow your kids to use their creativity. Whether it's a manufactured play structure, a tree house, a little bridge or a sand play area, try to provide props that the kids can use to build their own games around. Include elements that allow your kids to exercise. Swings, climbing structures and ball playing equipment are excellent, but be sure to include a blank area where kids can use simple, movable gear to play a variety of games. Make sure that each element you include in the play area is safe. Manufactured play equipment is required to meet Consumer Product Safety Guidelines for construction and installation, so be sure to follow the instructions. If you are building it yourself, adhere to the same standards. Be aware of your potential liability should a playmate be harmed. Children generally respond well to activities that allow them to take a journey into a "magic kingdom" or fairytale land that is exciting because it engages their imaginations. Create a magical- or fairytale-themed play area by creating a "set" in your home or classroom. If you are a preschool or elementary school teacher, think about creating several magical or fairytale sets in your classroom. Choose sets based on a story that you made up or on storybooks that you have read to your students. One approach to creating a play area is to create an environment for young children, like preschoolers, that offers a variety of toys and other items that provide the children with an opportunity to feel different types of textures and shapes. An idea for your hands-on play area is to create a grab bag for children to reach inside of, grab one item and then be asked to guess what the object is. Award a prize when children guess right. As most parents and educators know, children often like to pretend they are all grown up, imitating the dress and activities of adults around them, such as mom and dad. Therefore, real-life play areas offer children a chance to pretend they are grown ups and at the same time learn about skills they will one day need. For example, you could create an area that is a house where children can pretend to mow the grass, cook for family or wash the dog. Other real-life scenario areas could include a firehouse, a restaurant or a store play area. If you have children and yard space, you can benefit from constructing a safe, fun playground. Here are some tips that should help you to build a play area that is safe for your children. Use a cushioned material for the ground area. Build a soft floor for your play area with a thick lawn or three to four inches of sand, shredded rubber tires or other materials. Make sure any fill you use is deep enough to handle falls and safe enough that nothing will be dangerous or toxic if swallowed. Enclose the area for small children. Fencing in the play area will keep children from straying. If your attention wanders, you don't want your toddler doing the same! Buy fun toys and sports equipment. Choose well-constructed play toys and games that are safe for children and encourage climbing, clambering, jumping and other healthy physical activities. Place large toys or exercise equipment far enough away from each other that children won't bump into them while playing. Offer shade Having a shady tree or a shade construction near a play area will help keep it cool for the summer months. Consider building your play area so it is temporary. Time really does pass faster than we expect, so before you know it you may need to convert a toddler's play area into a more sophisticated space for growing children, then finally remove it altogether when your children grow too old to use a playground. Making fencing and flooring that can be removed will make it easy to convert the space into a lawn, sports area, garden or swimming pool in the future with minimal work and expense. 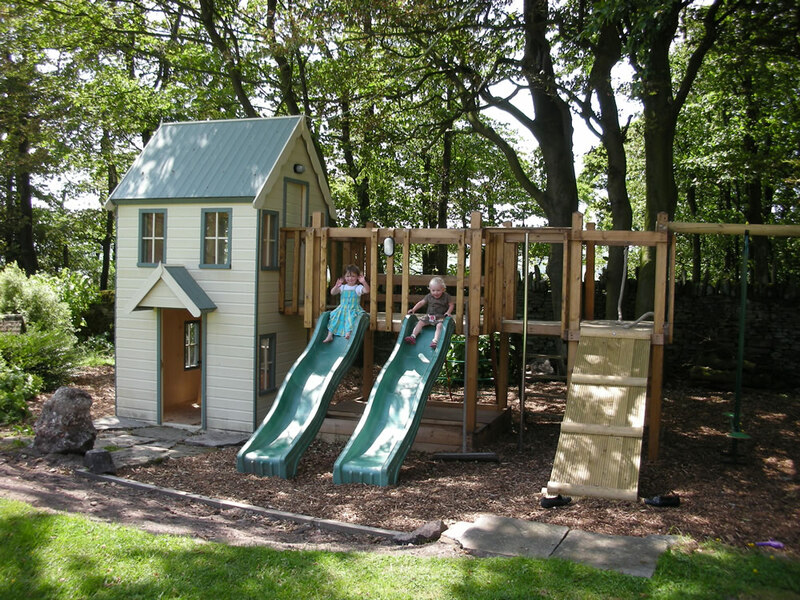 If you can afford it, there are ready-made play constructions you can buy that create ideal places for your children to play. Some are even themed as haunted houses, boats, fairylands and more. It is not difficult to build a play area for children. And it will keep kids occupied for hours having fun.